We are in the process of looking for a new male to breed to Rogue this month. We have a particular male in mind and are awaiting to hear from his owners. 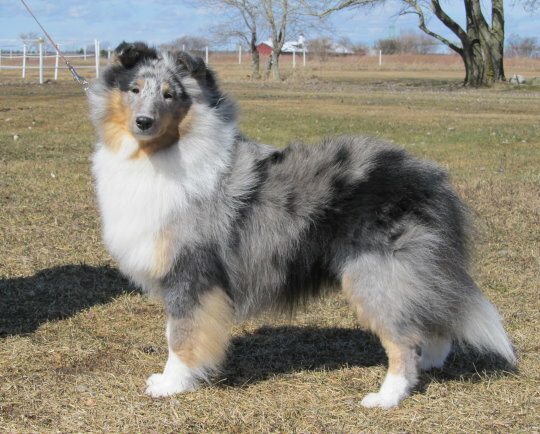 Rogue is a bi-factored/ blue-merle and is a proven dam who had a wonderful litter April 2014. Both puppies are presently in training for their Agility/Obedience/Rally careers. Both puppies graduated their Puppy Obedience class at the top of their class. She denotes effortless speed and smoothness. Rogue is intensely loyal, affectionate and responsive to all who meet her. She is OFA good, normal thyroid, VetGen vWD clear, MDR1 normal/M1 and normal CERF. I may give her another try in the breed ring next summer in Canada. She has been going to Obedience and Rally classes this spring, summer and fall and loves the classes so we will compete this November 7th and 8th at the Central New York Shetland Sheepdog Specialty in Syracuse, New York. Click on the picture above to e-mail me.